This is the time of year we often find ourselves thinking about what we want our lives to look like in the months to come. Our intentions might include spending more time with those we love, putting our health first, or excelling in our careers and perhaps changing our corner of the world. Wanting all three might seem impossible. Greedy even. But what if it weren’t? 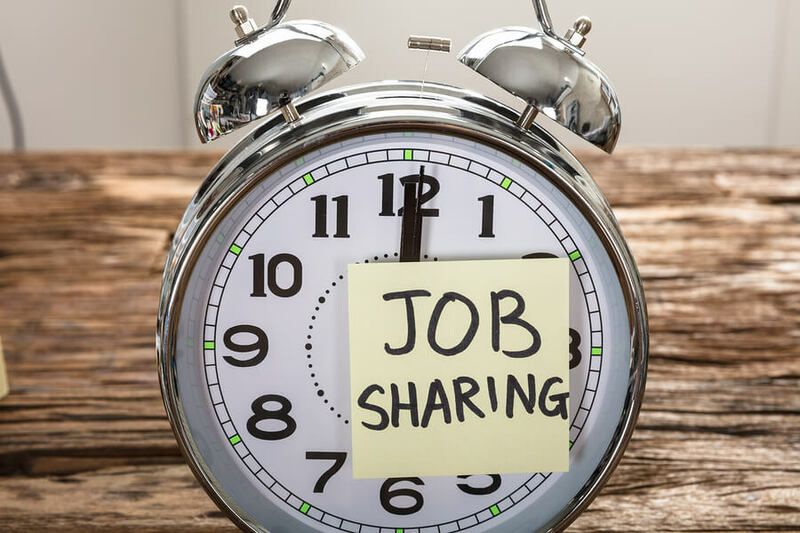 Job sharing is a flexible work practice you may not have considered or heard of, but could be your key to all three! By definition, job sharing is a partnership between two people to share the responsibilities of a full-time position. In practice, job sharers work half the week with a supportive partner while being better in their jobs than they ever imagined. The structure uniquely allows employees to separate and prioritize work and life making them some of the happiest, most loyal, and productive employees. Myth #1: Job sharing is complicated. Reality #1: Job sharing is simple in practice. Although job sharing seems complicated, it’s straightforward and simple in practice. Once job sharers put in the up-front work to decide handover, decision-making, and communication processes that work best for their team, stakeholders overwhelmingly experience positive results working with them. In fact, the thing managers fear most—accountability and communication—are where job share partners shine. Myth #2: Job sharing is forever. Your boss’s biggest fear could be that once your job share is approved, regardless of the outcome, they are stuck with it forever. Reality #2: Job shares are not forever. Building an entrance and exit strategy into your job share agreement will help reassure your manager that your job share works for everyone, including your company. Most job shares last two years on average although some have job shared successfully for decades or even transitioned through their careers as a team. People often job share during a transition in their lives like becoming a new parent or pursuing an advanced degree. They may job share at one stage, return to full-time work, then later choose to job share again. Myth #3 Job sharing isn’t flexible. Managers may assume that the job share schedule isn’t flexible or that the job sharers themselves will be inflexible or unavailable if needed during their “off” days. Reality #3: Job sharing is flexible and gives employers more. There are many ways to set up and implement a job share, but the bottom line is the arrangement should be designed around the role and needs of the company. The days and times of the week each partner works and shared or divided responsibilities are malleable, but the common element is a handover period and seamless communication between partners. Successful job sharers have flexible and willing attitudes. Job sharers often cover one another during maternity leave, medical leave, or illness and attend important training and company meetings as a team on their “off” days. Myth #4 Job sharing is for support jobs. It won’t work for my job or my industry. Reality #4: Job sharing works for most roles. Job sharing works in most roles, including sales and client-facing roles, leadership and team management roles, strategic and knowledge-based roles, fast-paced or highly transactional roles, and senior roles in global, fast-paced organizations. There are even lawmakers and CEOs who job share. Myth #5: Job sharers have a part-time mentality. The stigma around flexible and part-time working can carry over to job sharing. Employers may think that if you are working part-time and sharing your job, you are less committed to it. Reality #5: Job sharers are committed employees. Job sharers are high-achieving, committed employees—they’d just like to spend less time doing their job. They are highly accountable not only to their partners, but to all stakeholders to demonstrate how effectively their job share works. Myth #6: Job share partners must be an exact match. A common misconception is that job share partners must have the same personality or be of the same gender or background. Reality #6: Job share partners are more successful when they are not a direct match. Myth #7: You need to know your job share partner beforehand to be successful. Employees interested in job sharing and managers often think you must work at the same organization with your partner and even have known one another for many years to be successful. Reality #7: You don’t need to know your job share partner to be successful. Job share partners do not need to know one another at all or be from within the same organization to be successful. Finding your job share partner is likely much easier than you think. Network at industry events and in your community. Let it be known you’re interested in job sharing. Then, broaden your scope to include candidates of different backgrounds and those who might have different positions but whose skills can complement yours to elevate the role. Once you’ve found your partner, get ready to enjoy the hidden benefit many say is equal to the flexibility they find job sharing, the job share partner relationship itself. Melissa Nicholson is the founder and CEO of Work Muse, a job share solutions firm. Job sharing is a partnership between two people to share the responsibilities of one full-time position. Work Muse drives adoption of job sharing in business as a source of competitive advantage while helping individuals find work-life balance. 1MFWF contributors are eager to help make work flexibility the norm in businesses across the country and worldwide.